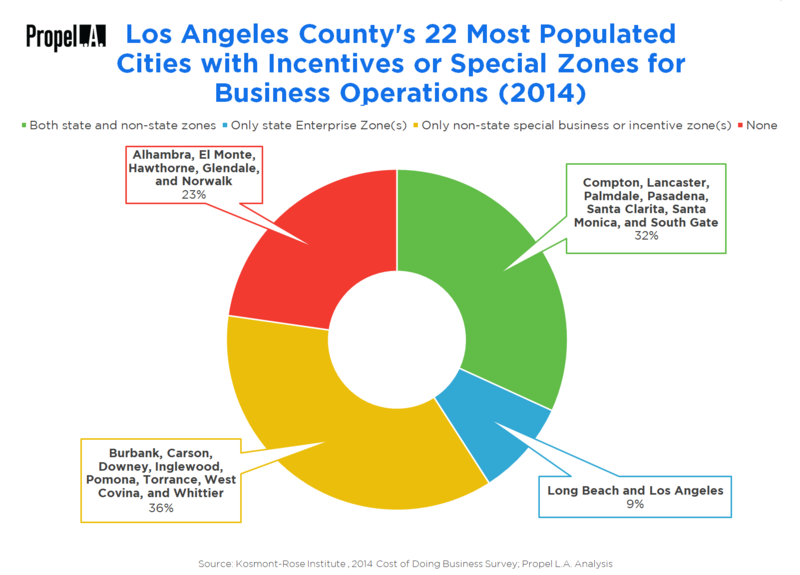 Incentives and Special Zones for Business Operations in Los Angeles County | Propel L.A.
As of 2014, 32% of the 22 most populated cities in Los Angeles County have both state Enterprise Zones and non-state special business or incentive zones. However, almost a quarter of the 22 most populated cities do not have any special business or incentive zones. This data, from the Kosmont-Rose Institute at Claremont McKenna College, suggests that Los Angeles County should strive for more business friendly practices. Note A: Propel L.A. divided the 88 cities in Los Angeles County by population size into four equal parts. The top quartile is comprised of these 22 cities: Los Angeles, Long Beach, Glendale, Santa Clarita, Pomona, Palmdale, Pasadena, Torrance, Lancaster, El Monte, Inglewood, Downey, West Covina, Norwalk, Burbank, South Gate, Compton, Carson, Santa Monica, Hawthorne, Alhambra, and Whittier. Note B: This metric utilized the 2014 “Cost of Doing Business Survey” from Kosmont-Rose Institute at Claremont McKenna College. Propel L.A. currently does not have access to the most recent 2015 Survey.